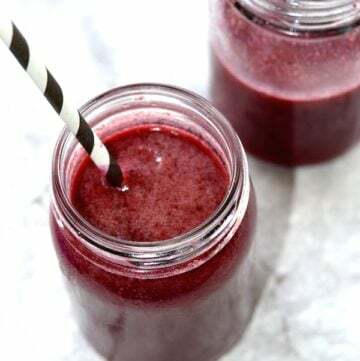 Here are 5 gentle vaccine detox ideas for kids that will help get rid of toxins and heavy metals. Yes, you can easily and gently detox from all the unwanted stuff! Feel better knowing your kids are getting the benefits of vaccines without keeping the toxins inside their bodies. Much has been speculated about the effects of vaccines on ourselves and our children, but an important fact often overlooked is that the toxic ingredients used in vaccines accumulate in the body and will stay there if nothing is done to expel them. I do vaccinate my children and this post is not intended to be for or against vaccination. It is a very controversial topic. And I believe it is really a personal choice. Do your research and make an informed decision for your family. Whatever you decide is what you think is best for your children anyway. Childhood vaccination is a very controversial topic. There is just no simple or clear answer for many people. I’ve read horror stories from both sides and respect people’s opinions. I don’t think we should be judging parents for vaccinating their kids or not doing it. People get very upset about this topic and the only true thing is that we are all doing what we think it is best for our families. But I am very concerned about vaccines. You hear the stories, the side effects, the bad reactions. And this is why I wanted to come up with a solution to feel a little better about my decision to vaccinate my kids. Now, this is great because if you decide to vaccinate, you can detox afterwards from the stuff you do not want but get the benefits of the stuff you did want. Sounds like a good deal to me. 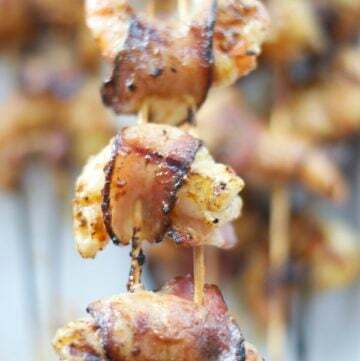 The best part is these are all gentle vaccine detox ideas. All natural and safe. What stuff can kids detox from? Common unwanted ingredients found in vaccines are: sucrose, fructose, dextrose, potassium phosphate, aluminum potassium sulfate, peptone, bovine extract, formaldehyde,FD&C Yellow #6, aluminum lake dye, fetal bovine serum, sodium bicarbonate, monosodium glutamate, aluminum hydroxide, benzethonium chloride, lactose thimerosal, ammonium sulfate, formaldehyde, glutaraldehyde, bovine extract), calf serum, aluminum phosphate, aluminum hydroxphosphate sulfate, and ethanol. Does this sound like a list of substances you want in the bodies of you and your family? 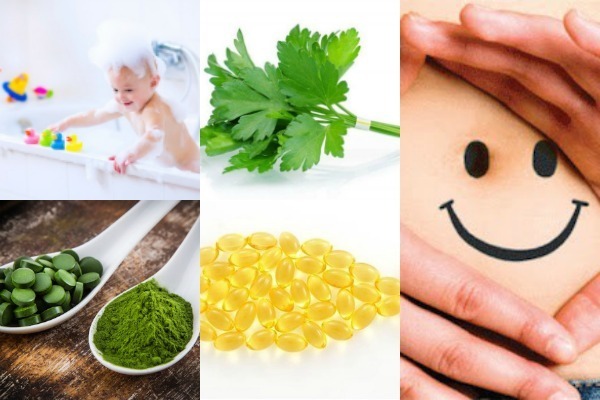 If the answer is no, there are a number of measures you can take to detoxify your body from these unwanted ingredients. It makes me feel good to know we are getting rid of all the nasty toxins. These are 5 gentle vaccine detox ideas for kids you can easily incorporate into your routine. Epsom Salts are perfect for kids and adults. Taking a detox bath will help your kids relax, clean their systems of toxins, and absorb wonderful minerals that will strengthen their immune systems. A good detox bath is also one of my favorite ways of kicking a cold fast. Find out more HERE. 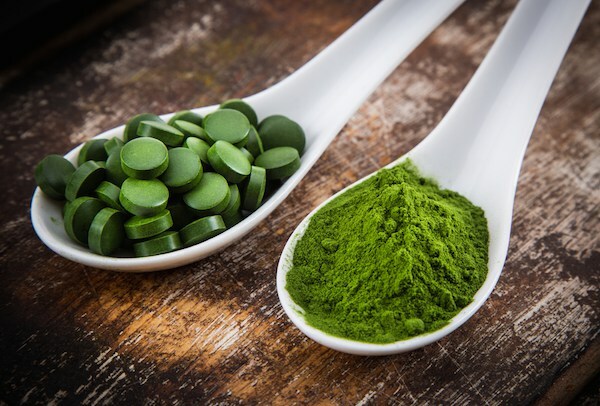 Chlorella is effective in binding heavy metals in the body. It can be taken in capsule form, or ingested in other ways such as being added to smoothies in powder form (perfect for kids). The effect of chlorella results in toxins being passed out of the body by natural processes of elimination. Many experts say taking chlorella with garlic is a wonderful combination for detoxing faster and more efficiently. Taking probiotics to maintain a healthy gut is quite a common practice, but many don’t realise that whilst they are aiding good bacteria in the stomach they are also fighting against toxins and other heavy metals from vaccines that end up in the gut, and thus altering the bacterial balance. I also recommend this Raw organic probiotic supplement for kids. Organic yogurt is also a great source of probiotics, along with other sources such as saurkraut, kombucha, kefir, and fermented vegetables. 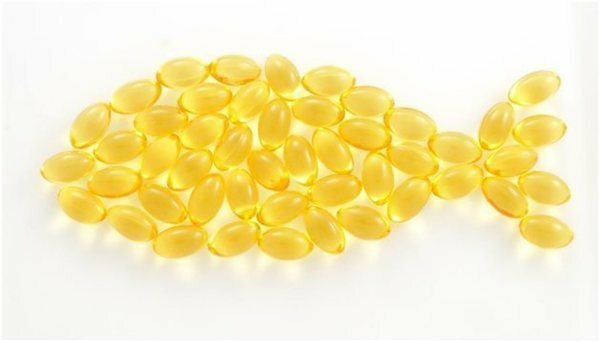 Whilst aiding healthy joints and bones, Cod Liver Oil is also highly effective against excitoxins, and at the same time repairing damaged cells. Taking Omega 3 is a fantastic way to detox from toxins and heavy metals. I highly recommend Carlson’s cod liver oil as a supplement for kids. 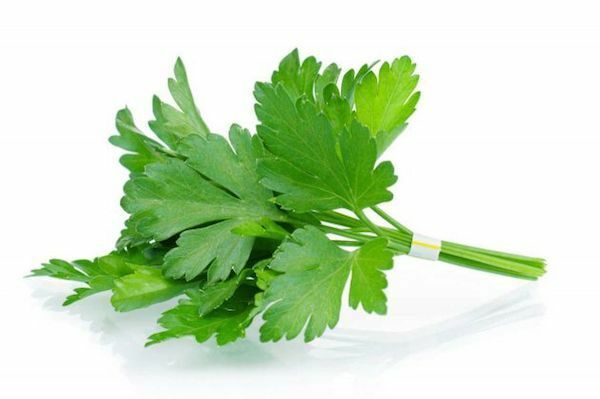 The herb Cilantro is said to remove heavy metals from the brain by crossing the blood-brain barrier. It is one of the gentlest detoxifiers and it is also highly effective in eliminating mercury and other heavy metals from your body’s organs. I love adding cilantro to my salads and favorite recipes. You can also create a cilantro bath by adding 6-7 drops of cilantro essential oil. More information about vaccines and natural remedies. For more information on vaccines and which ones are needed for your family, please click HERE. If you are interested in more natural ways to strengthen the immune system, please see 7 Ways To Boost Immunity And Get Ready For Flu Season. You can also see my Natural Remedies section for more information and my latest posts. This information should not replace professional advice by a qualified medical or herbal practitioner. 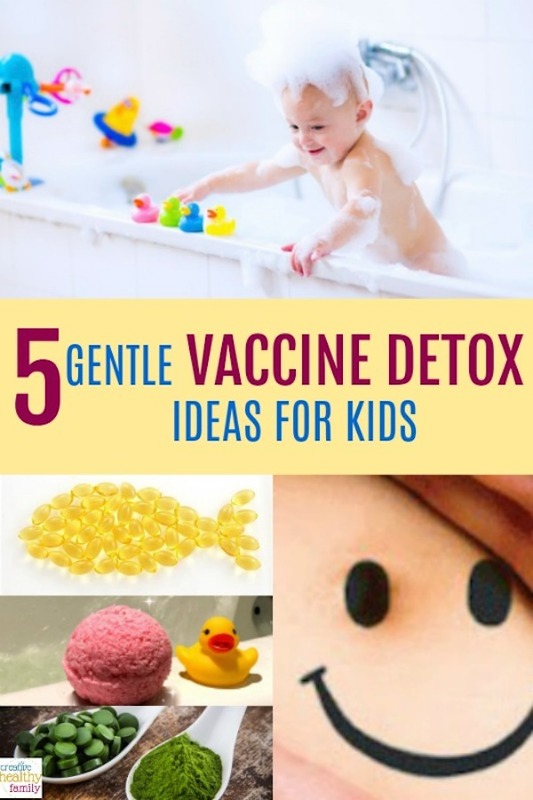 This 5 Gentle Vaccine Detox Ideas For Kids post contains affiliate links. The products linked are the products I use and recommend. If you purchase a product through an affiliate link, your cost will be the same but Creative Healthy Family will automatically receive a small commission. Your support is greatly appreciated. My grandsons was just diagnosed with autism their not sure where he is on the spectrum scale he’s almost 2 years old will detox help him. Hi Donna, I have read about magnesium helping kids with autism. I also know of many studies that show certain foods and chemicals affecting kids with autism. So yes, I think it will help! Can I ask, what were your grandson’s symptoms that made him get diagnosed? I feel like my son has some minor symptoms and I’m severely worried. But I’m too scared to take him to get tested since there’s no real test. It’s solely based on the dr’s opinion. What were your grandson’s symptoms that lead to his diagnosis? Thanks for the tips, I’m always looking for ways to keep my little ones healthy. How long do you do this detox? 15-20 mins in the bathtub and I try to give my kids a bath after vaccinations or when they have a cold. Good blog. Thanks! Saved it. I read somewhere that giving a enema or series of enemas also helps. Believe it was a herbal enema. I know that a catnip tea enema or a garlic enema helps bring a fever down. Hi Julie, I just give my kids epsom salt baths. The cilantro is good for detoxing if you eat it. My baby is 3 months. How does detox work if I am breastfeeding. For example, if I take cod liver oil and so on, will that release the metals in my body and go into his breast milk OR will the benefit of omega 3 and cilantro etc benefit him as well so that he can detox? I am so glad to read this information. I have recently vaccinated my 15 months old baby and I fear so much the consequences of the heavy metals contained in the vaccines. I would like to understand though the dosis of clorella and cilantro I can give her, for how long and how many times I should repeat the detox program. Is anyone able to advise? I much appreciated your support! Thank you for your comment. I don’t have an exact amount of dose. I just make sure to include them in their smoothies after vaccines and I also give them a good detox bath the day after. Hope this helps. My 15 yr old daughters had a vaccination about 3months ago, would doing these still help them or is it too past it? It sure will help. We can detox from all the bad stuff we have accumulated in our bodies from the past. I’ve heard holistic doctors detox their patients from childhood vaccines. Hope this helps! Is there a certain time frame you do the detox for? Like do a detox bath 1-2 times a week for 3 months or have cilantro for x amount each week? Etc..? I give my kids a detox bath a day after vaccines. You can also try the rest of the ideas after vaccines for a few days after your kids get vaccinated. Hope this helps. Thank you for sharing this great information. Is epsiom something I can do with my 2 month old? We had our shots last Monday and I would love to detox him. I don’t think it will be good for a 2 month old but check with your pediatrician and see what she/he thinks. Hope this helps. Nutritionist with master’s has us consuming legumes or psyllium husk ($10/pound bag in my health food store). This may sound strange if youve never had the chemistry explained or read/watched a DVD about it. Note, A local ER physician called her to ask what he should do with a patient who was dying in front of him from heavy metals ingestion. She went down and they gave him raw garlic and beans about every 20 minutes … It saved his life. www. karenhurd.com. I just had to share that detox gem. That’s amazing! Thank you for sharing this story. Has any one heard of the liver? It’s like totally the best for detoxing. The best thing is it’s free. Also there isn’t mercury in vaccines anymore and you get more aluminium from drinking water than a vaccine. Better have an Epson salt bath after each glass of water. So, yes, vaccines still contain mercury. The liver does detoxify the body, but we are loading our liver with an unprecedented amount toxins from any point in human history. 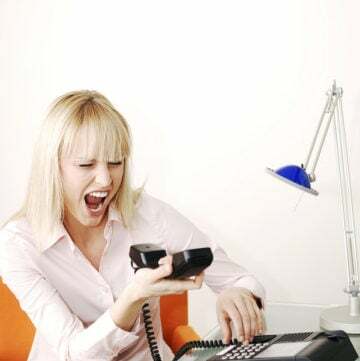 It can get overloaded, which is the start of many health problems. Thank you for this article, how long should you to the baths or give the cilantro, os it ok for a 2 year old? I live in France and there had been concern that fish oils have mercury and it can be dangerous for kids, it’s this a concern in America too? do you have any suggestions of brands? Hello, I usually give them the bath once after vaccinations and try to incorporate cilantro in my meals that week. It is totally fine for a 2 year old. Remember to also check with your pediatrician at your regular checkups. Mercury is a concern for certain types of fish. I recommend Carlton fish oil. You can get it online at Amazon or any other health food store. Hope this helps. I have a 13 month grandson that a very bad reaction from his vaccinations. I purchase Carlson Baby Cod Liver Oil, along with salt baths and Chlorella powder. How much of each should I give him, and how often. The Instruction on the bottle for the oil only give the recommended dose for age 2 and up. Should we just give him half that recommended dose? And how often? The same is true for the Chlorella powder. How much? How often? Hi, So sorry to hear about the bad reaction. Hope your grandson gets better soon. Regarding dosages you should follow the recommendations on the package and also consult with your pediatrician. I always do both 🙂 Hope this helps. It is a hard decision that you have to make. I decided to vaccinate my kids and didn’t delay any vaccinations. I know some friends who did delay and some didn’t vaccinate at all. It is a decision every parent has to make. Talk to your pediatrician and see what she/he thinks. Some doctors will delay vaccinations and have a different schedule if the parents want to do it that way. Hope this helps! My son age 4 just had his second mmr and dtap shots. 13 days later he is breaking out in hives. Had swelling in hands and feet could this be vaccine related??? I’m freaking out. Er said not possible but I don’t see what else it could be. Nothing has changed in his routine. Even spoke to his preschool and working together to figure out what could be causing it. We illuminated stuff one by one. Still no answer. It goes away with benadryl. Anyone experience this??? So sorry to hear that. I haven’t experienced that so I really don’t know. Hope your son gets better soon! The reactions you are describing are ON THE INSERT INFORMATION AND ON THE MANUFACTURER’S WEBSITE. Please go look it over and/or demand your dr to read over the insert with you. Chances are that they have NEVER read it themselves. Please report the reactions. They need to be documented. There are many ways to detox. These odeas are a great start! Yes there’s a good chance it’s a reaction to something in the vaccine. There’s is a laundry list of reactions and severe reactions for all vaccines especially MMR. Japan actually banned this vaccine from being administered in their country. Research and educate yourself on the effects and reactions, your doctor won’t know because they are not taught anything in regards to vaccine reactions or even the ingredients in school. Don’t take my word for it, look it up yourself. Best of luck with your son, I pray it’s nothing serious. No vaccinations are necessary. You shouldn’t be implying they are on an article for detoxifying from vaccine; that’s contradictory. If you doubt the product or fear the aftermath of a vaccine, please don’t do it. These companies have no liability insurance and some levels of metals can be fatal. Don’t be bullied by doctors or schools! They will answer to YHVH. I am a certified health coach with countless hours of continuing education. I would, for starters, immediately stop vaccinating. Vaccines are zero % effective, and 100% toxin mess thats extremely harmful to our children. 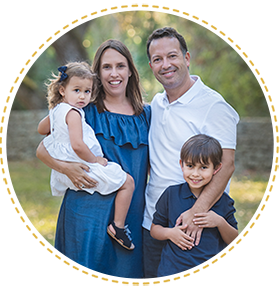 There are so many exemptions to them and I would advise looking into that, along with finding a good holistic (naturopath) physician and D.C. Detox baths are great for helping previous damage, but would not continue doing do, esp if not sure your child may have MTHFR. They alone cannot detox these vaccines. Thank you for your comment and your opinion.